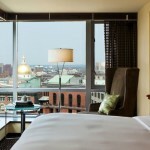 The Nine Zero Hotel is located in Boston, Massachusetts, in the United States. The hotel has suites with artistic decorations. 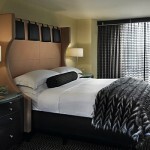 The hotel has 190 double rooms, deluxe rooms and suites. Each room has a large double bed and a bathroom with a shower. The rooms have access to WiFi. The hotel can provide guests with any items they may have forgotten at home, ranging from toothbrushes and towels to clothes. There is coffee and fresh press at the lobby. Each rooms has a large desk with a chair. Several rooms are designed for guests with reduced mobility. Guests will be able to enjoy the personalized service the hotel is known for. Each bathroom has animal-print robes for guests. Some of the rooms have hypo-allergenic facilities and furniture, ideal for guests with allergies. The minibar is filled to the brim with organic products. The large windows have views towards the city and the river. The Queen Deluxe rooms have a queensize bed. These rooms are decorated with colourful cushions. The King Premier rooms are similar, with a large kingsize bed. Each of these rooms has its own lounge area designed by Martini. The Queen Premier Rooms are large rooms with a queensize bed and a separate lounge area. These rooms have views towards the city. The Queen Queen Premier rooms are family rooms. Each room has two queensize beds and a bar area. The Skyline View Rooms are deluxe rooms with views towards the city center. There are rooms with a queensize bed, rooms with a kingsize bed and rooms with two queensize beds. The bathrooms are larger. Each rooms has an iPad with apps about the city and the events that take place in the city. 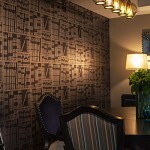 All rooms are decorated in neutral colours and have bluish lights. They are decorated with murals of the Statehouse, one of the city’s most famous buildings, which is located in the nearby Beacon Hill district. The Specialty Suites are themed suites. One of these suites is a studio room decorated with antiques, a large table, a mural with novels, a globe and several chandeliers. The Lodge Nouveau is a room with decorations similar to those that can be found in traditional cottages in the Alps, with wooden furniture, carved wooden statues of deer and a large living room with murals and faux fur sofas. 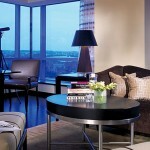 The Cloud Nine suite has a large window with views towards the city and there is a telescope in the living room. The Woodland Flat suite is decorated in greens and a palm tree chandelier. 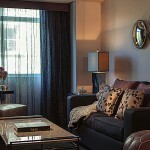 Studio 501 is a silver suite with sculptures and embroidered cushions. Each room has a yoga mat for guests who want to relax practising this sport. Guests who are members of inTouch will be able to enjoy personalized service. The hotel has a restaurant where guests will be able to enjoy breakfast, lunch and dinner. The bar has views towards the city. Guests will be able to enjoy personalized menus, adapted to their tastes and food allergies, and have dinner in their rooms. Wine tastings are organized in the lobby every afternoon. The lounge, which is located on the second floor of the hotel, offers complimentary coffee and tea. The hotel has its own gym. Spa treatments and massages with organic oils can be enjoyed in the rooms. There is a business center with a fax, a photocopying machine and Internet access in one of the halls. Guests will be able to organize events at the conference halls. There are several conference rooms that can be joined together in order to form larger rooms. The hotel provides a catering service for large events. The hotel is located next to many museums, close to the center of Boston. Guests can explore the city center on foot. 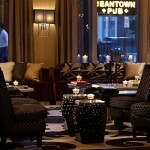 Several blocks away guests will find the famous neighbourhood of Beacon Hill and the Boston Common.